This chic, contemporary sofa has a striking look created by bold shapes and clean lines, perfect for a contemporary styled living room. The modern look of this sofa was created by rounded flared arms, wide back cushions, exposed wood block legs and welt cord trim. The plush seat cushions are specially tailored for comfort, with our multi-layer reflex cushions, a firm yet resilient seat is guaranteed. 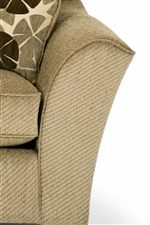 Kiln-dried hardwoods, heavy gauge sinuous springs, and quality cushion construction ensure that your sofa will be durable and stand up to everyday use for years to come. 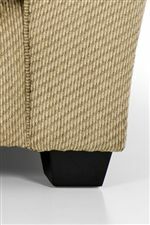 The 112 Contemporary Sofa with Flared Arms and Exposed Wood Feet by Stanton at Wilson's Furniture in the Bellingham, Ferndale, Lynden, and Birch Bay/Blaine, Washington area. Product availability may vary. Contact us for the most current availability on this product.